Starting this year, Russian embassies in the UK, Denmark, Myanmar and Namibia will launch a pilot project requiring applicants for a Russian visa to be fingerprinted. The Russian Foreign Ministry announced two important changes to visa procedures, which will make entering the country a bit more cumbersome. According to Yevgeny Ivanov, head of the consular department of the Russian Foreign Ministry, these changes do not signify a tightening of the visa rules but are part of the modernization of visa procedures. The Russian Foreign Ministry has already drafted a presidential decree on collecting biometric personal data, based on procedures in several other countries. 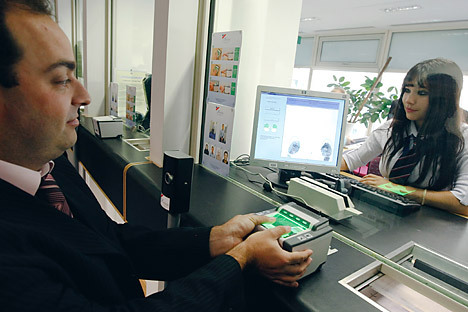 Collection of biometric data as part of the visa application process is widely used by the consular services of many countries, including the United States and the UK. The EU has announced plans to do the same for Russian nationals starting from 2015. In addition to collecting fingerprints as part of the visa application process, fingerprints will be scanned at border control at Moscow's Vnukovo airport. The UK will become the first country where applicants for a Russian visa will be fingerprinted, possibly as early as July 1. Denmark will be next. These two countries have been chosen since the pilot scheme is expected to test coordination and interaction in fingerprinting collection between the Russian diplomatic missions and the visa centres operating there. “It is expected that biometric data will be collected mainly at the visa centres, which would make it possible to avoid long queues at the Russian diplomatic missions where, as you know, people come not only to get a visa but to resolve many other issues as well,” Ivanov said. Myanmar and Namibia have been selected because they are countries where the number of applications for a Russian visa is relatively small. “There it will be first of all necessary to test the viability of the new system given how remote our diplomatic missions in those countries are, how reliable the equipment and communications are,” Ivanov added. The completion date for the pilot project has not yet been set. However, once it is over, the relevant amendments will be introduced to the current legislation, after which the Russian authorities will roll out the new procedure at all embassies and consulates. “We do not view fingerprinting as a sign of Russia introducing tougher visa requirements, rather it is part of the modernization of the whole process,” Ivanov said. Additionally, following instructions from Russian President Vladimir Putin, preparations are under way to introduce a new procedure requiring international passports for citizens of CIS member states to enter Russia, although the new rules will not apply to Belarus and Kazakhstan, which form part of the Customs Union and the Single Economic Space. “Given the large amount of reciprocal travel, especially in the cross-border areas, consultations are under way with the Ukrainian side to agree on how to minimize the possible inconvenience that the new rules may cause to the citizens of both countries,” Ivanov added. This story is based on reporting from RIA Novosti and Rossiyskaya Gazeta.